Sorry, but we do not accept credit cards. A hair cut designed for the individual needs of a woman. Your stylist knows that a woman's hair is different, and has different needs. 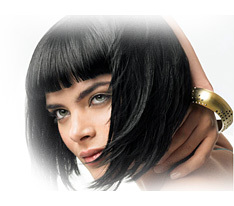 Your stylist also understands that your hair cut is a big part of your personal appearance. We will help you choose the perfect cut for you. Our stylists are dedicated to helping you maintain your new cut and style. A bang trim is one of the ways we help you maintain your cut. Come in for a quick trim in-between hair cuts. We're kid friendly! We love to make your little darlings look great! Our kid's haircut is a special service just for the little ones. Let our stylists who are great with kids trim off the extra fly-aways while Mom and Dad get their own hair style. These conditioners are a perfect add-on to any service. They smooth the hair, help do away with split ends and, keep the hair healthy.